Which is the best superzoom lens for your Canon DSLR? A key advantage of DSLRs over compact cameras is that you can fit the ideal lens for whatever you're shooting. The downside is that when you're on your travels, you may not want to be weighed down by a big bag full of extra lenses. With a mighty zoom range, a superzoom lens will typically deliver focal lengths of 18mm at the wide-angle end and anything from 125mm to 270mm at its longest telephoto zoom setting. This gives you an effective zoom range of between 29-200mm and 29-432mm on the Canon APS-C bodies all eight lenses on test are designed for. The big questions are: how great a zoom range can you get without sacrificing image quality, what features are required to make superzoom lenses really effective, and how much do you need to pay for them? A standard 18-55mm zoom lens on crop-factor Canons offers respectable wide-angle coverage, equivalent to 29mm, while its effective 88mm focal length at the long end is good for portraiture. But it runs out of reach if you want to zoom in on distant targets. The general solution is to swap to a telephoto zoom, such as the Canon EF-S 55-250mm, which closes the distance with a maximum effective focal length of 400mm. But sometimes things aren't that simple. In dusty environments, there's always the risk of your camera ingesting dirt while you're changing lenses, which can end up stuck on the sensor. Nobody likes black blobs on all their shots. In situations where you need to react quickly to take advantage of unexpected and fleeting photo opportunities, it's also a major disappointment to miss the shot because you were too busy changing lenses. In these conditions, superzoom lenses reign supreme. They're also ideal as holiday or travel lenses, because they're so compact and lightweight, making them perfect for when you want to carry around the bare minimum of photographic kit. Back in the days of 35mm film photography, most superzoom lenses tended to offer focal length ranges of around 28-200mm or 28-300mm. For APS-C cameras, 18-125mm and 18-200mm give equivalent zoom ranges. But some lenses, such as the Sigma 18-250mm OS and the Tamron 18-270mm VC, go further still. Bigger might seem better when it comes to zoom range, but any superzoom lens is a compromise. With added complexity in design and the physics involved in delivering extended zoom ranges, optical performance is likely to be impaired. Compared with lenses with a modest zoom range, you can expect a superzoom to have less outright sharpness, increased chromatic aberrations and more pronounced distortions. Distortions can also take on a nonlinear character, so straight lines are not only bowed but can take on a slightly wavy appearance, which is particularly problematic for architectural photography. These degradations in optical quality may be exaggerated in lenses that try to push the boundaries in terms of extreme zoom range. However, some of the very latest designs manage to maintain good optical quality while giving you the ultimate in zooming versatility. One thing that all superzoom lenses lack is a 'fast' maximum aperture, and those with the largest zoom ranges typically drop to f/6.3 at the telephoto end. Shooting on a dull day at ISO 100, this can often require shutter speeds of around 1/30 sec, which is far too slow to avoid camera-shake. Optical image stabilisation is therefore a key feature of good superzoom lenses, and most of the latest designs include a 4-stop stabiliser, enabling you to get consistently sharp handheld telephoto shots at 1/30 sec. Fast, accurate autofocus is a major ingredient for success, especially at longer zoom lengths. Depth of field is greatly reduced at telephoto focal lengths, so focus accuracy becomes critical. Standard micro-motor autofocus systems can be very precise, but are often relatively noisy and can lack speed. 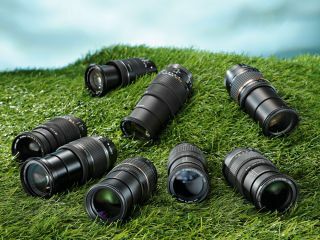 The Sigma 18-125mm f/3.8-5.6 DC OS HSM, the Sigma 18-250mm f/3.5-6.3 DC OS HSM and the Tamron 18-270mm f/3.5-6.3 Di II VC PZD feature quieter Hypersonic or Piezo Drive autofocus - similar to Canon's USM (Ultrasonic Motor) system, which is lacking on both of Canon's superzoom lenses for APS-C cameras. It's important to realise that not all ultrasonic autofocus systems are created equal. Upmarket 'ring-type' systems are best, because these are virtually silent, very fast and offer the added benefit of full-time manual focus override in One Shot AF mode. However, the type fitted to the Sigma and Tamron lenses feature a small ultrasonic motor rather than being based on large rings that are mounted around the inner circumference of the lens. They're still quieter and faster than regular micro-motor autofocus systems, but not as near-silent or swift as ring-type ultrasonic systems, and lack full-time manual override. All in all, they're good but not great.